Janis wanted a Mercedes Benz. Others dream of owning a Ferrari. I honestly couldn't care less for cars. But I do care for kitchen appliances. So you can imagine that it was not without some emotion that I took the chance to cook on what one of Italy's leading food and wine magazines defined as "the Ferrari of stoves": a Molteni stove. For those interested in fine restaurants Molteni stoves are surrounded in an aura of legend: they were and are in many of Europe's top kitchens. 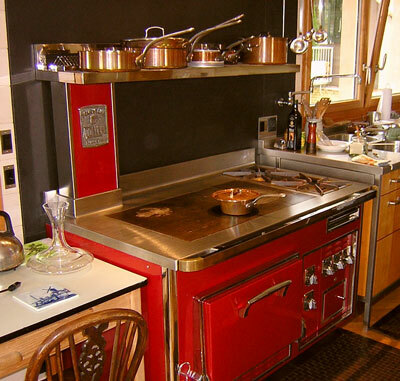 Big names like Ducasse and Bocuse have their own impressive made to measure stoves. Plus, don't they look just great? The old fashioned pasta cutter. I confess: I'm an absolute softie when it comes to old-fashioned kitchen tools. I'm no big fan of stereotyped images of Italian cuisine such as "mamma's cooking", but I admit that whenever I see an old chitarra pasta maker or a garganelli comb I give in and start musing about the old times gone, when the whole family would make pasta at home instead of buying it. Not that I ever lived in a family that made pasta every week, but it's still nice to be a sentimental sucker from time to time. Nonetheless, since most of my family comes from Northern Italy, making fresh stuffed pasta has remained a tradition we follow on special occasions. Be our guest for Christmas and you'll be strongly encouraged to help shape hundreds of tortelli, tortelloni and anolini. It's that or washing up, you see. Having practiced for years, I can say I'm getting quite good at this. Or better at everything except cutting the pasta dough into the regularly shaped squares needed to have a batch of tortelli where each one looks identical to the next. To do this free hand you really need special skills. There are those who could cut series of equally spaced parallel lines without breaking sweat, ending up with perfect tortelli every time. I've always been in awe of these people. I, on the other hand, am one of those who would probably finish with a bunch of psychedelic curved patterns guaranteed to give you visions if you only took a moderate dose of hallucinogenic substances. And definitely crappy looking tortelli. A good reason to be on the lookout for new pasta cutting tricks and tools. It's hard to deny baking parchment is a great help for the baker. For the last few years my baking parchment consumption has been quite above average. Whenever lining a cake pan or a cookie sheet, I'd turn to my parchment roll (and a drop of oil). It certainly was an improvement from the constant buttering and flouring I used to do before. Up to a few weeks ago, at least. up to the day I bought a Silpat silicon baking mat from Demarle. Since I've become interested in cooking I've had a fascination for cooking gadgets. whenever I happen to be in a nice cookware shop the temptation to increase my collection becomes almost overwhelming. Don't I need that olive stoner? And what about that panini grill... it looks neat. I try to control my shopping sprees and actually manage quite well IMO but not in that of my sweetest half. Yes, every now and then some new little gadget will find its way in our kitchen drawer/shelves. Since our kitchen space has reached its limit, this now means only small utensils. There are a few of these tools which will eventually become accepted , since their usefulness has proofed itself: my nice zester and the digital kitchen thermometer have finally made it into Daniela's "good gadgets" list :-). But there's one or two of them which remain a talking point or actually an arm in our little game of poking fun at each other. Of all my gadgets the no.1 bad-guy is no doubt my truffle slicer, which you see above, followed closely by the gnocchi board. 1) I'm never going to use cup measurements again. NEVER, EVER! If I do kick me in the shins. Please :-). From now on, only mass units here. 2) You can use kids building blocks to build your own baguette pan, at least for proofing. IF your son/daughter lets you ;-). Happiness is... a new pizza stone! Finally the parcel containing my new pizza stone arrived! If you like baking as much as I do, one of these thick terracotta slabs is a really handy thing to have. They're pre-heated in the oven and, while baking bread, give off a nice bottom heat, resembling to a certain extent a brick oven. According to most baking books, there are few materials that one could use as baking "floors" and I went through quite a few of them. I started baking using unglazed tiles as "standing" layer for my breads, but they moved too much around and I found that very wet dough tended to seep between them. I then bought my first pizza stone which, I didn't notice at first, had a little and very thin crack which soon became a big one and split the stone in two pieces :-(. Still, those few times I baked with it were enough to convert me to pizza stone. It took me a while to find a new one. In the meanwhile I used a baking sheet, turned upside down. This is quite OK. actually much better than I thought, and all the breads that appeared on this page were baked this way. Now I finally found someone selling pizza stones in Germany. Even better, it came with a handy wooden peel. Can't wait to try this out!! Toys and boys: new knives!! I have to admit the Global knives are not cheap, but I felt I deserved to make myself a late Xmas present :-). Also, I'll be not buying any knives for a few years so I guess that helps me to settle my bad conscience. Oh boy, can't wait to go back home from work today and do some chopping.... vegetables look out :-). On a more serious note: what knives do you use? Any special knife you couldn't do without?